Covers are enticing. They’re designed to catch the eye, get you interested, and even possibly, take your breath away. Most of the time, covers allude to the possible action inside, to what has the potential to be an awesome issue. Case in point is Captain America Annual #8. To be quite honest, that is one awesome cover. To me, this gets me pumped to a fantastic showdown between the two men who are polar opposites of each other. You have on one hand, Captain America, defender of all that is good and just, and Wolverine, the best there is at what he does, and what he does isn’t very nice. One is a team player, the other only when he needs to be with the X-Men. Claw vs. Shield. Sparks flying. The heat of battle! Let’s take a look at this, shall we? Let’s see just what’s in store for us in this weeks Back Issue Bin to the Future. Let’s look at Captain America Annual #8! It starts off simply enough. Wolverine is in a bar, just outside of Westchester, home of the X-Men and their base, Xavier’s School for Gifted Youngsters. Sometimes, Logan just needs a place where he can have a beer and a cigar, and let the world pass him by. Tonight, it would seem, is not one of those nights. In this bar is a man who is being attacked by some dudes who just can’t stand a mutant. It’s not really working out too well for them though. This mutant disposes of his attackers, one by one, with little ease. His name is Bob Frank, and to Wolvie, that sounds rather familiar. As Bob leaves, Logan pays for his drink and high-tails it after ol’ Bob. With his heightened senses, Wolverine is able to keep tabs on Bob, but then, as he passes through some dense foliage, he’s gone! Seconds later, Wolverine hears the sounds of a fight, and with a quickness, Wolvie arrives in time to see Bob being attacked by a massive robot! Bob is being smashed into pulp as Wolverine dives to his rescue. A pretty awesome fight ensues, but as Wolverine starts to get the upper hand, the robot flies off, only to hover for a moment next to it’s controller. With his impressive hearing, Wolverine hears the word “Tess.”, before the robot, and its master fly off. Filing that away for later, Wolverine goes back to Bob, who’s in pretty bad shape. A hospital is ten miles away. In full sprint, Wolverine can have Bob there in 40 minutes. Mark Gruenwald’s story doesn’t really do much for me after this. Once Wolverine’s introduction is over, we switch to the hero who’s mag this is, and it all kind of slides downhill from here. With cheesy dialogue and really no reason for Cap to be in this part of the country, we’re tossed in to him exploring his way through some kind of bunker from back in the ’40’s. It’s one death trap after another before Captain America figures out that something was in here, but escaped. With more terrible dialogue and the worst truck hijacking in history, followed by Captain America’s “awesome” Stars and Stripes tip network (right?) , we’re brought our promised fight! It lasts all of a page and a half before we’re brought back to the main reason for this issue, Tess, the giant killer robot, and it’s master, Overrider. I was expecting so much when I picked this up. I was expecting a good reason for these two to fight, along with a solid story to back it up. 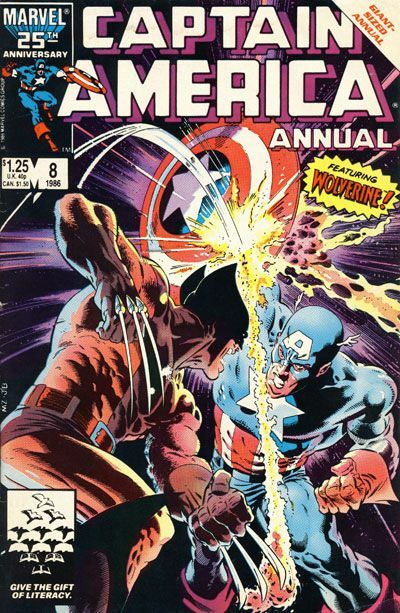 Both characters are rich in history and character development, but here, Gruenwald gives us a plain, forgettable issue. It has no drive, no focus, and no heart. It’s 40 pages of disappointment that could have been so much better. The only saving grace in this entire issue is the artwork. Mike Zeck’s pencils are amazing. The cover alone should speak volumes, but interior artwork shines as well. While the story itself suffers, Zeck is able to keep us entertained though his masterful visuals. The short battle between Cap and Wolvie looks great, as does the rest of the issue, from Logan starting off the issue, to Captain America’s trek through the dungeon type bunker, and finally to the battle against Tess and Overrider. It’s visually appealing, satisfying, and wonderful. Zeck’s work stands as some of the best, and this issue shows why. It’s not very often that I’m disappointed in a book. Two come to mind off hand: Harbinger #1 (from old Valiant stuff), and Youngblood #1. Both of those issues where set to a certain standard for me, and neither one held up to it, much like this annual here. With Harbinger, I was expecting good story. I mean, I had heard nothing but awesome things about the issue that jump-started Valiant, but after I read it… Well, read the review for yourself and you’ll see. The same, most certainly, can be said of Youngblood, and I believe that’s gotten the lowest score I’ve ever given, and not without just cause either. This issue, unfortunately, falls in line with Harbinger and Youngblood. I was expecting so much when I started to read this, and when I finished, I was glad it was over. Annuals usually get a bum wrap for being toss-away issues with forgettable stories and even worse artwork. Here, only half of that is true. With a story that will leave you wholly unsatisfied, the visuals are it’s only plus. Get this for Zeck’s work, if anything, and leave the rest behind. Parental Concern: None, unless you’re looking to punish your child.